Martin Family Moments: The First Year of Preschool is Completed! The First Year of Preschool is Completed! Declan graduated from preschool on Monday. Does this mean he's going to Kindergarten next year? Nope! He's moving on to another year of preschool. He finished the 3 year old preschool and will enter the 4 year old preschool in the Fall. Two years of preschool ain't bad though, three of our kids had three full years of preschool before Kindergarten...at every graduation, we would joke they should be ready by 3rd grade by the time they leave preschool. So many years of school under their belts before school ever really starts. Maybe that's why they're all great students? Ha! Declan is soooooo sweet and sooooo shy, as I'm sure these photos make obvious! Then all the kids sat down and we watched a slideshow with photos from the year to the song "Never Grow Up" by Taylor Swift, which I had never heard, but definitely cried through the whole thing. Here he is with his awesome teachers, faith filled women of God who really take care of these precious children. Declan with his adoring parents and grandparents. Declan seems to have a smile on his face no matter what he's doing. His baseline emotion is happy! 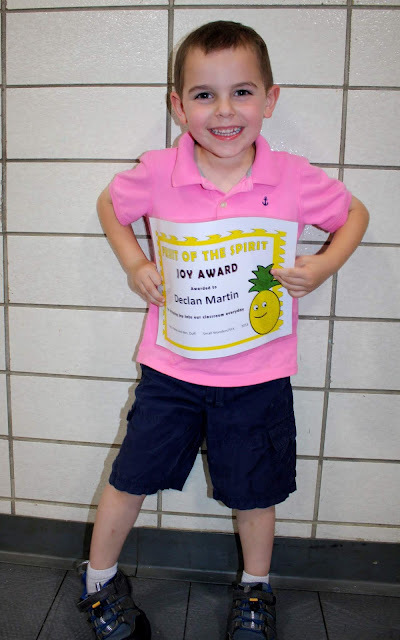 His teachers couldn't have given a more perfect award to him: The Joy Award. It says "For bringing joy into our classroom everyday." What a little mama's boy! I never understood it when moms would wish for their kids to stay little. Let them grow up! Don't hold back their greatness! Moms are supposed to learn to let go! But, oh, this boy. He has turned me into one of those moms who wants to freeze time and keep him this way forever. What a sweetheart. He's such a good little boy that we fear he might be our worst teenager, but to have gotten to know him at all is worth it. Thank you Lord, for the gift of Declan's life. When the world has hinted that we have too many children, when people make comments about how they already have "one of each" and they don't make any other kinds, you prove them wrong. Even though you're our 6th child, and one of six boys, you are such a unique and lovable individual. You're so very special to us, and all of your siblings adore you. We are so excited to watch you grow (slowly though, ok?) and see what God has in store for you. We love you, Declan Kolbe Martin. He is just the cutest thing!! What a great picture of the three of you. That song gets me every time. Declan is the sweetest. Maybe he and Meredith will go to college together in the future and be friends! My oldest just graduated from high school and I am totally in to letting them grow slowly. It's so cliche, but it the years go by so quickly! Love all the pictures of your little cutey!